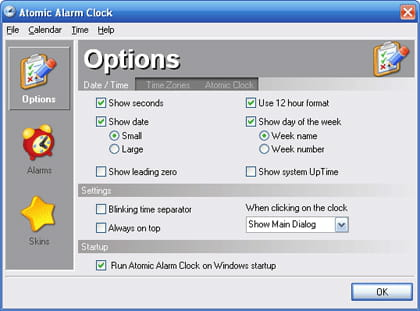 Atomic Alarm Clock is a program which proposes a clock in order to replace the Windows one. It also offers other options such as alarm clock system and an hour synchronization module. Clock: Once this tool is executed, it automatically replaces the standard clock of Windows system. The hour can be displayed under different time zones like New York and the user has the possibility to synchronize it with different atomic clock servers. Customization: Atomic Alarm Clock allows the user to modify the appearance of the clock with a skin in case the new one does not suit him. He can entirely customize the display such as the date or the day of the week. Reminder: This software can be used as a reminder to remember important events or the tasks that need to be done. It has many audio files to be used as alarm or he can import MP3 files from his hard disk. Atomic Alarm Clock offers up to 36 skins to choose from. It is light and its functioning requires little random access memory. Latest update on August 20, 2015 at 05:05 PM.